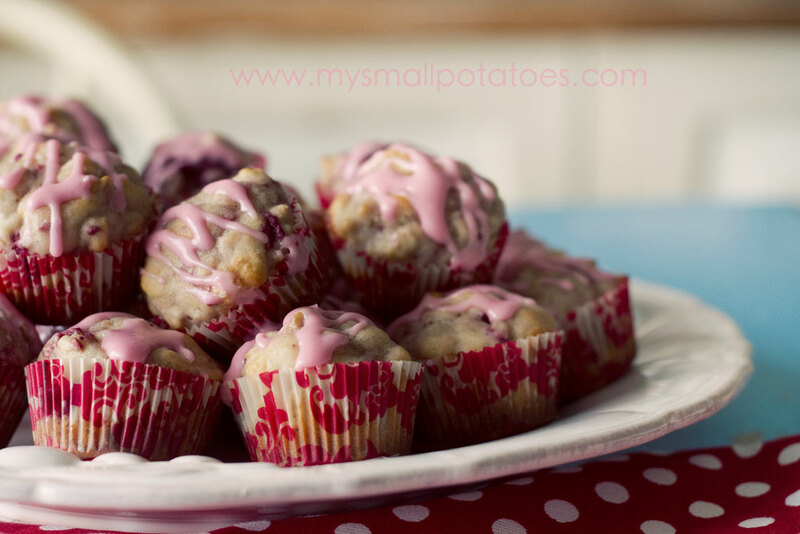 Raspberry oatmeal muffins. And don’t forge the glaze. It’s the best part. Now this is where I get lazy. 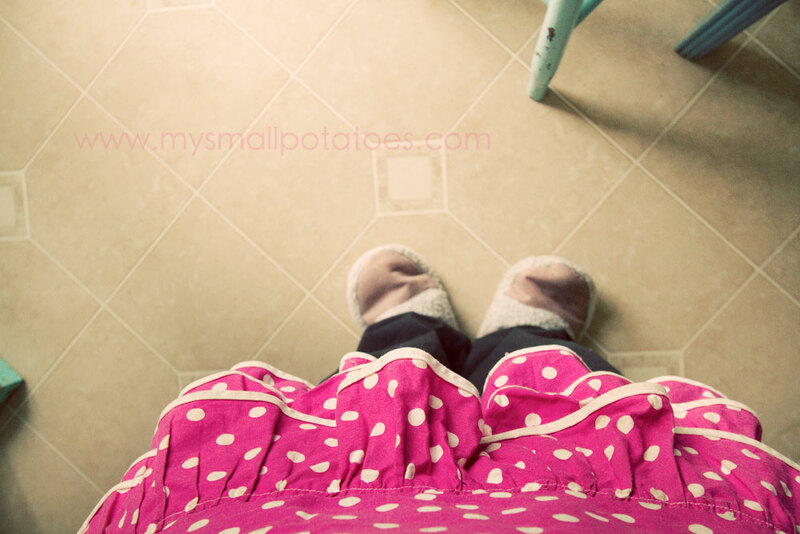 I’m not a fan of dishes. 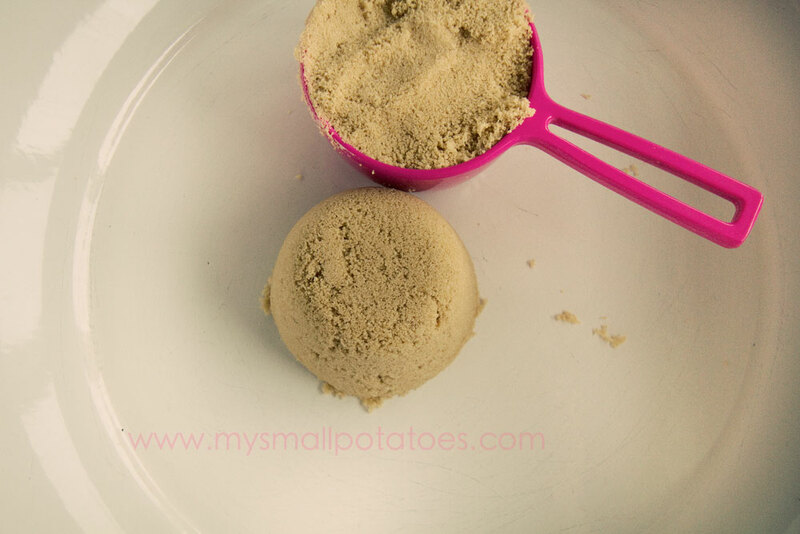 This means I don’t WANT to get a separate bowl to mix my dry ingredients in. So I don’t. 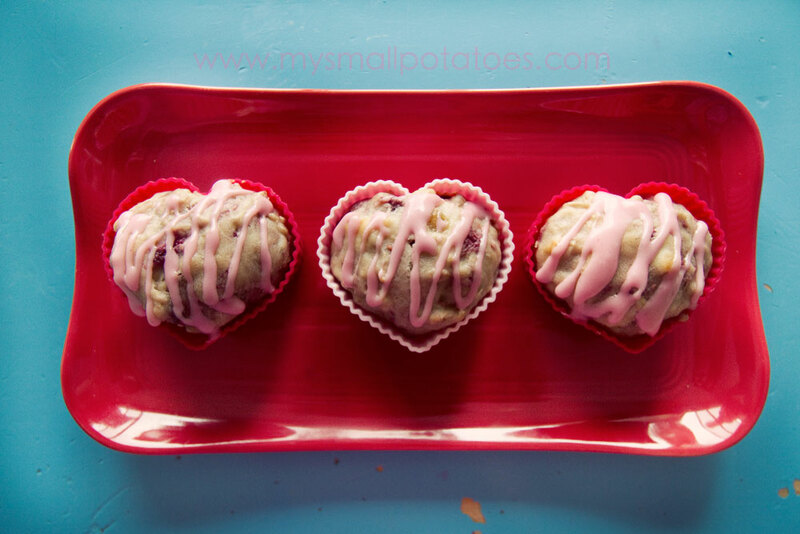 They’re just muffins…not a souffle! 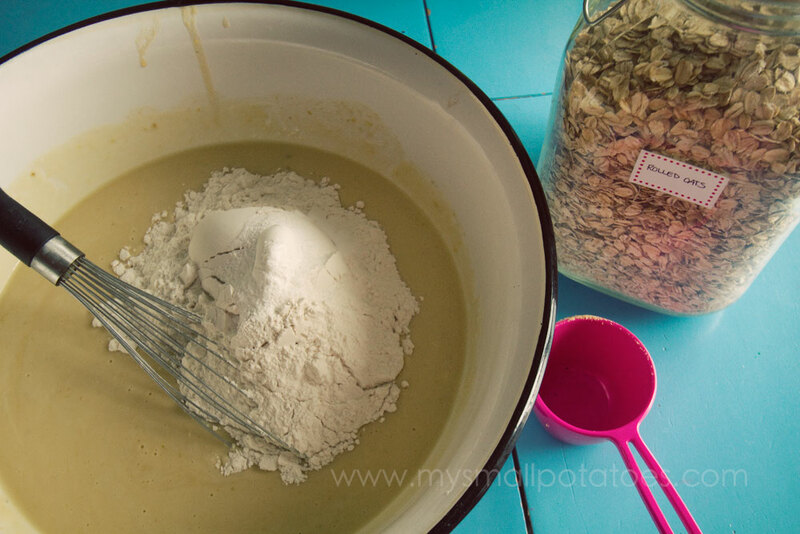 I pile up all my dry ingredients on one side of the bowl just like this… Then I add my oats on the other side and kind of mix them all gently on the top of my wet ingredients. 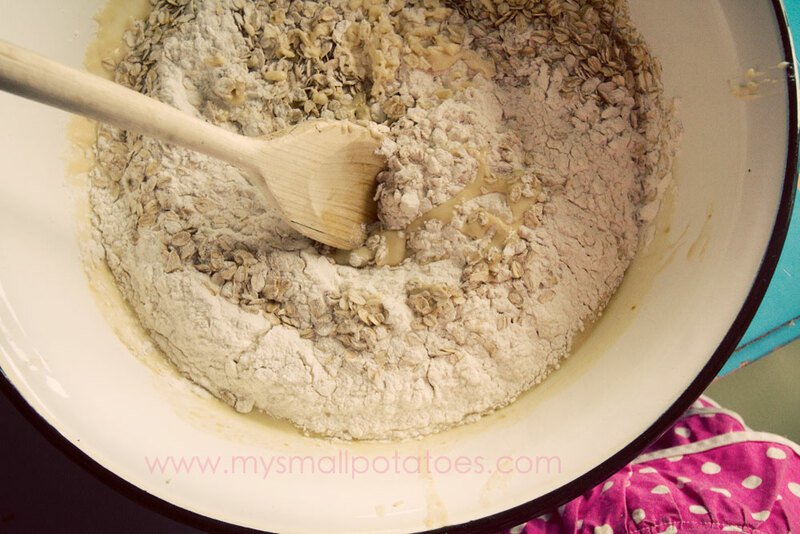 Once they are kind of jumbled together, I dig right in and start mixing the wet into the dry… *Side note: I would use quick oats if you have picky eaters in your house…some of the smalls didn’t like the big chewy bits. 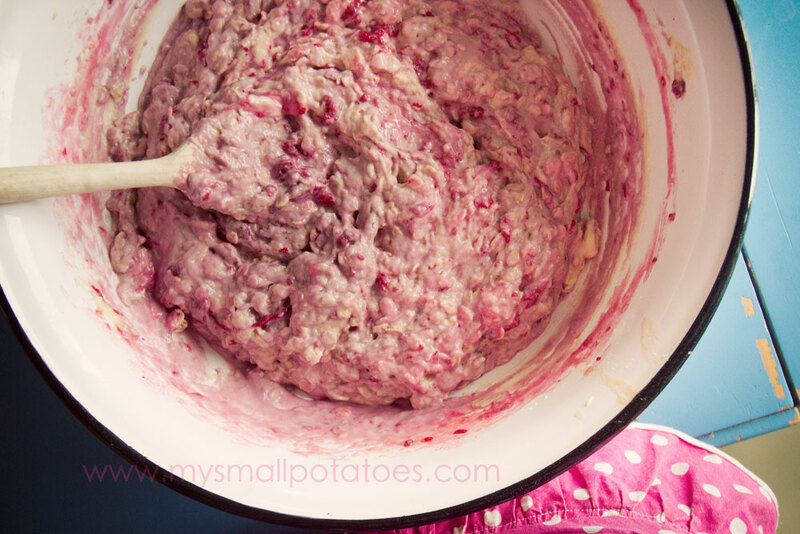 Now you can fold in your raspberries. I had some frozen raspberry puree in my freezer from the summer, so I used a cup of that. 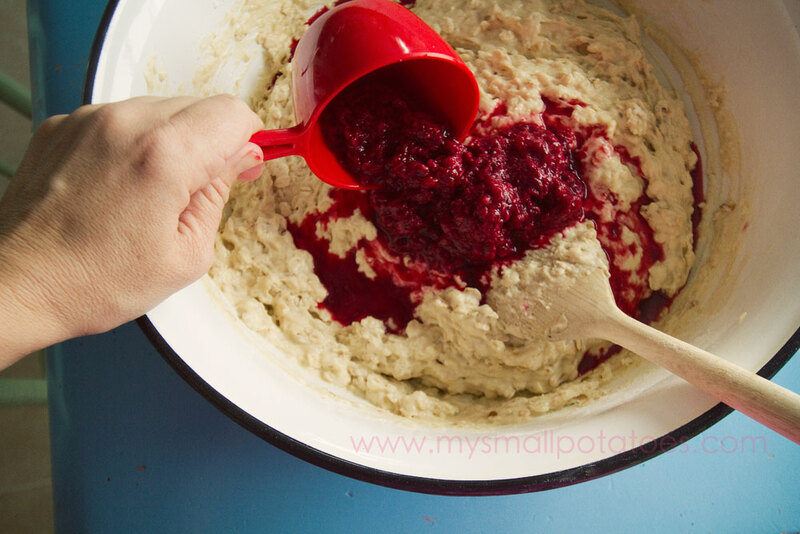 If you are using fresh or frozen whole raspberries, you should use 2 cups so you get a good, strong raspberry flavour going on. 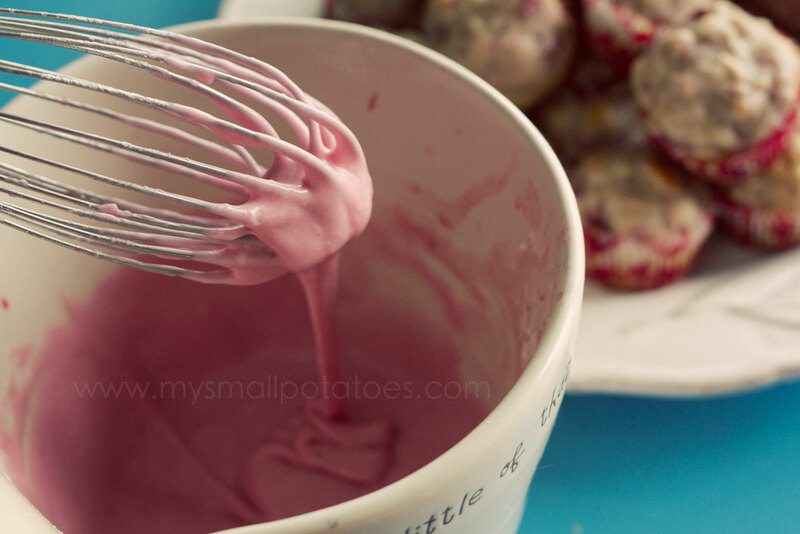 Mix gently until your batter is pink… *If you are using fozen raspberries, your batter will not turn pink, but it will still be pretty! 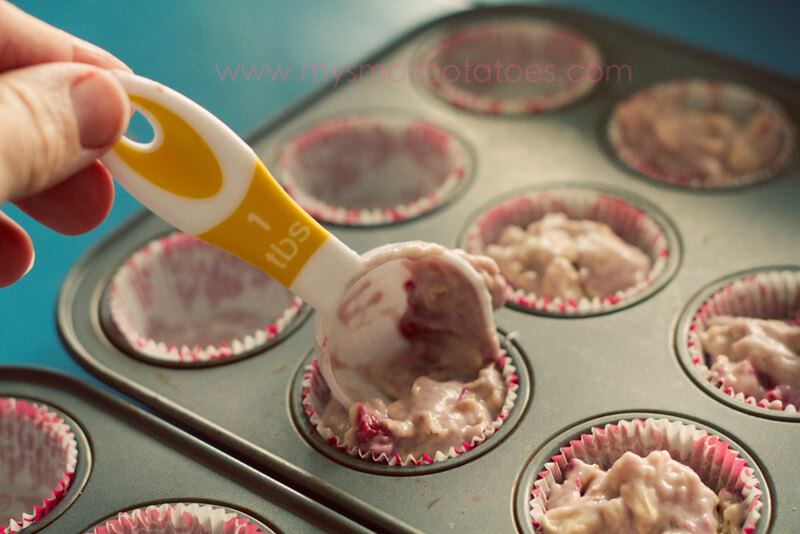 I used tart-sized pans for our muffins so they could fit in the kids’ bento boxes… Drop batter by the tablespoonful into your muffin papers… Bake 10-12 minutes for the tiny muffins. 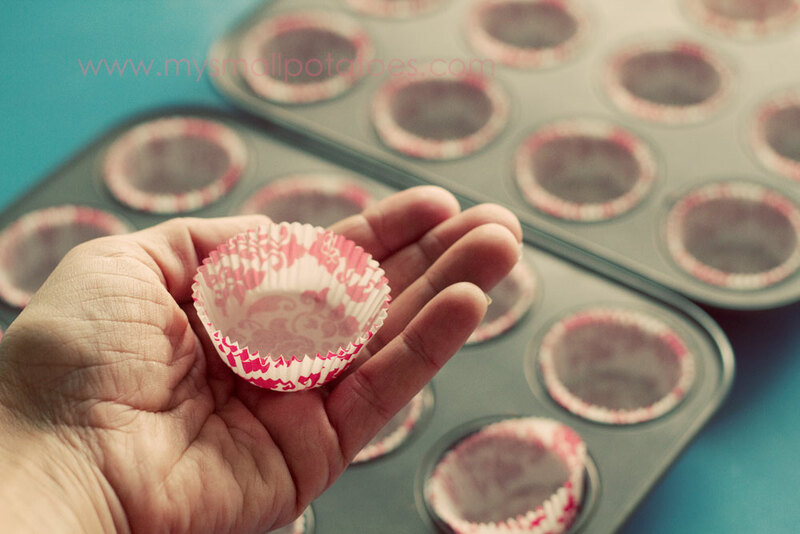 If you want to make the muffins larger, by all means go ahead! I made some heart-shaped ones in the bigger cups. They baked for 15-18 minutes. 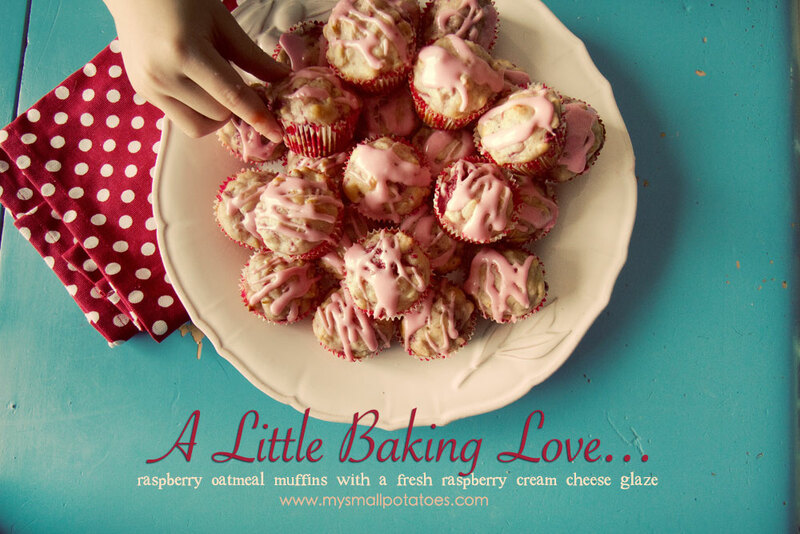 Yum, can’t wait to make these for carson’s class on Valentines Day!!! Στο κλίμα των ημερών, όπως σας υποσχέθηκα, δε θα βρείτε δικές μου ιδέες, μα ιδέες που μοιράζομαι από άλλους! Αυτή είναι μια εύκολη συνταγή, δεν τη δοκίμασα, ωστόσο, για κάτι γλυκό και -φαινομενικά- ελαφρύ! Αν σ’ αρέσουν τα μούρα και οι φρουτώδεις γεύσεις στο γλυκό σου μπορείς να το δοκιμάσεις! Θα προσέθετα, αν το έφτιαχνα, λίγο κακάο στο μείγμα και μερικές σταγόνες σοκολάτας για ένα πιο… γλυκό αποτέλεσμα! Τέλος, θα πασπάλιζα με λίγη άχνη ή -για να γίνουμε και λίγο γραφικοί- κακάο (γλυκό, όχι bitter!). 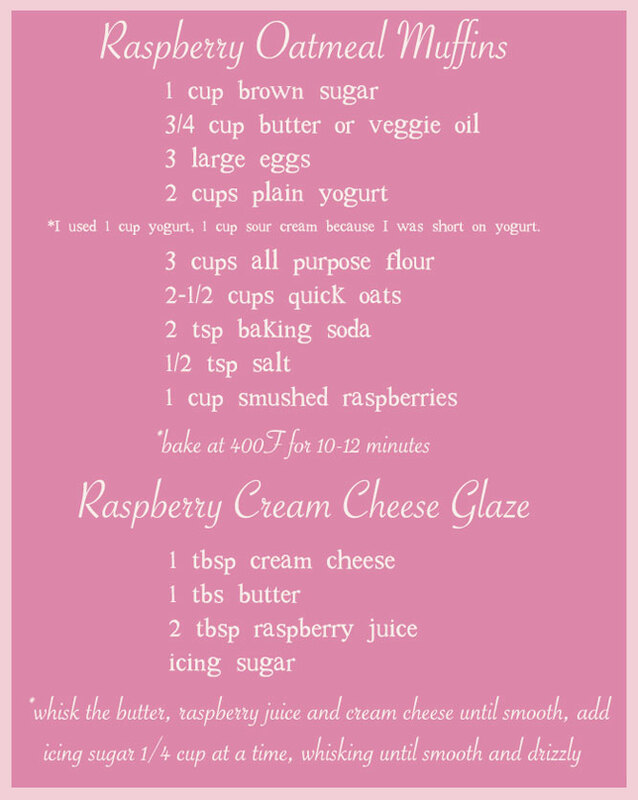 On the glaze, is the butter softened or melted? Thanks! Looks like a tasty recipe!! This looks so cute and tasty! Thanks for sharing!